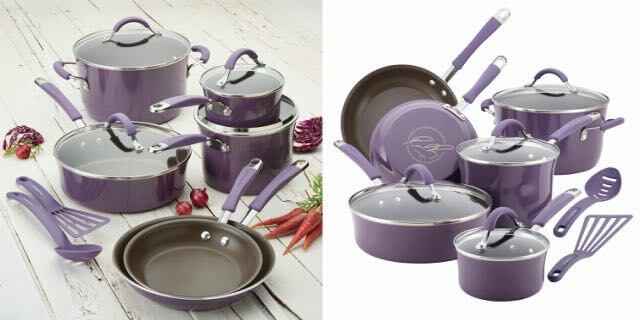 FREE Rachael Ray 12-Piece Cucina Porcelain Cookware Set! Enter now to win this freebie! You could win a FREE Rachael Ray 12-Piece Cucina Porcelain Cookware Set! Normally $104.99! This Rachael Ray Cucina cookware features rustic colors and modern design that fuses relaxed style and everyday functionality. Crafted with durable aluminum construction and sturdy porcelain enamel exteriors. The PFOA-free nonstick coating releases foods effortlessly for perfect meals every time. Oven safe to 400 degrees Fahrenheit, the pots, and pans are suitable for all stovetops, except induction. The 12-piece cookware set boasts dual-riveted rubberized stainless steel handles and shatter-resistant glass lids. What are you waiting for? Hurry and enter this giveaway to win your very own set! This giveaway ends on 4/27/18. Crafted with durable aluminum construction and sturdy porcelain enamel exteriors,espresso-colored, PFOA-free nonstick releases foods effortlessly. Previous articleSuncast Outdoor Trash Hideaway Just $33.15 Shipped!